Could the recent spate of suicide bombings in the north, a relatively unusual occurrence previous to recent weeks, have something to do with this? - From a letter signed by 108 Iraq oil and law experts: “With our conviction for the need of a law to organize the upstream sector and its development, and due to its extreme importance, we emphasize the importance of acting steadily…and not rushing its issuance before enriching it with more discussions and carry out amendments that ensure the interest of all the Iraqi people." - Anonymous senior Iraq official: "I think it's a legitimate call…This law is going to affect our lives; it's going to affect the lives of our children." Iraqi Kurds have come out against the new oil law just approved by the Oil Ministry because of language changes made by the Shoura Council in the name of constitutional conformation but which the Kurds claim make unauthorized alterations. The law has been in dispute since talks began in February. It was supposed to be done by June. It was approved by the Oil Ministry in early July. This latest dispute emerged the week of July 11. The KRG is the latest interest group to turn against the law. Sunni and Shia groups and the oil workers union have already rejected it because of it decentralizes control of revenues and allows too much participation by foreign multinational oil corporations. The Kurds prefer many of the things to which the other groups object and what the changes most likely addressed. KRG Natural Resources Minister Ashti Hawrami: "It's taken this back to square one, frankly…[The Shoura Council assumes] the constitution will be changed and they took the view the (disputed) articles in the law should be brought in line with the future constitution, not the current constitution…You can't be more political than that, with no authority…[The Council made] their legal review with the assistance and guidance of the Oil Ministry officials….We want this law to go through, but we want this to go through as agreed…"
Talabani predicts conflicts over the new oil law will be resolved though cautions time is short. The “hydrocarbons law” approved by the Iraqi Oil Ministry during the first week of July was subsequently altered to the disapproval of the KRG last week. The Kurds would open the Iraqi oil resources to “free market” model and welcome participation by foreign multinational oil companies while other groups want more control by the Iraq National Oil Company. Baghdad representatives are presently in Kurdistan negotiating. The Talabani statement came from Washington. - Sunni and Shia groups hostile to the al-Maliki government as well as oil workers unions and populist movements want more centralization of oil revenues. The Kurds want more autonomy, especially as it pertains to control of their own northern oil reserves. - Kurds have a longstanding distrust of Baghdad and have been semi-autonomous since 1992. They are negotiating for a very difficult role in the new nation’s government, somewhat independent and yet with a voice in how the country as a whole is governed. The KRG claims this is the intent of the 2005 constitution. 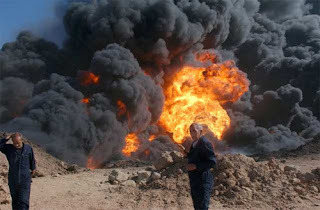 - Iraq has 115 billion barrels of proven reserves and possibly much more. It is currently producing under 2 million barrels/day but was producing 2.6 million/day before the war. If the infrastructure is modernized, the country has enormous potential in the short run. The oil law now in dispute is one of four necessary to be decided on. Contentious parties say settling this first one lays the groundwork for settling the next three. - Talabani: "I doubt we'll veto the law based on a few scattered changes…However, we still need to ensure we stick within the guidelines outlined in the constitution…Some substantive changes were made [in the oil law as originally approved]…Some language that we had put in has been taken out. Now whether it has been taken out with malicious intent or whether it has been taken out because it was deemed not legal language is what we're trying to determine." - Talabani: "It's concerns that we have that are a result of history. And neglect. Mismanagement throughout its history. It's made us as Kurds very insecure that future governments in Iraq will mismanage the resources…"
- Talabani: "It's difficult to say how long we will wait…We know that this is part of a much larger picture and we don't want to do something that could upset the larger picture…We've been patient up until now. I think we'll continue to be patient. We'll continue to be pragmatic. We can't have an all-or-nothing policy and we've seen this throughout the negotiations, there are things that are going to upset us as Kurds, there are things that are going to upset our Arab brothers…"